The band, Haim are quickly garnering both commercial and critical success. Their live performances are outstanding, their album Days are Gone has received gold level sales, as well and critical acclaim by both music journalists and their fellow musicians. Their music has frequently been likened to that of the legendary Fleetwood Mac, and it seems as though they are only going to go on to bigger and better things in their future, having just signed with Jay-Z’s Roc Nation management group. The band have recently hit out at those who characterise them as an all ‘girl band’, saying that this description is insulting to them, with its ‘medieval’ associations. After all, would we call Muse an ‘all boy band’? No. It’s clear to see why the band are offended by such gendered descriptions. The question of the gendered description of the band arose in regards to a question about the band’s touring drummer, Dash Hutton, who happens to be a male. Haim were in Australia as part of the Laneway Festival 2014 tour in February, and are the latest from indie festivals’ strong female lineup to offer their stance on the gender divide of the male-minded state of today’s music industry. They follow New Zealand’s singing sensation Lorde’s anti-sexism editorial about her rise to fame, a powerful and sophisticated piece from the seventeen-year-old, and Chvches singer Lauren Mayberry’s opinion piece about the misogyny she faces fronting the Scottish synth-pop band. Even more recently, Sky Ferreira also tackled the ‘vile, sexually abusive’ comments she regularly experiences in public outcry ahead of her debut Australian show in early March, and Sydney producer and performer Anna Lunoe harshly critiqued the lazy music media for their sexist approach following a journalist’s comparison of her to Miley Cyrus, adding to the ongoing and much needed industry discussion. Particularly in Australia, female musicians have stated that the state of the music industry appears to be a male-dominated ‘boys club’, and makes it hard for them to get exposure and gain recognition. Late last year, a celebrated group of Australian female performers, including Megan Washington and Tina Arena, hit out at the unfair treatment of female artists in a Sydney Morning Herald article. Haim hail from Los Angeles, so it is clear to see that the gendered terminology and fights against sexism in the music industry are issues in the United States as well as in Australia. In order to make any significant change in the manner in which female music artists are represented and given exposure, it must be an industry change. 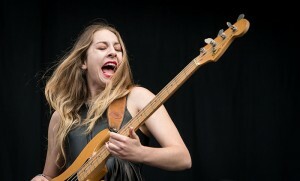 Until then, it’s best to characterise Haim as a trio of talented siblings, or an indie rock band from Los Angeles. Here’s hoping that the industry is listening to these many talented female musicians and actively fighting to make a change. Is it wrong for me to say that I like girl bands? I use it as a compliment, simply because there are so few bands that are all female. I admire them for that, I’m not meaning to insult them. This entry was posted in Feminism, Music and tagged feminism, Haim, music, News. Bookmark the permalink.